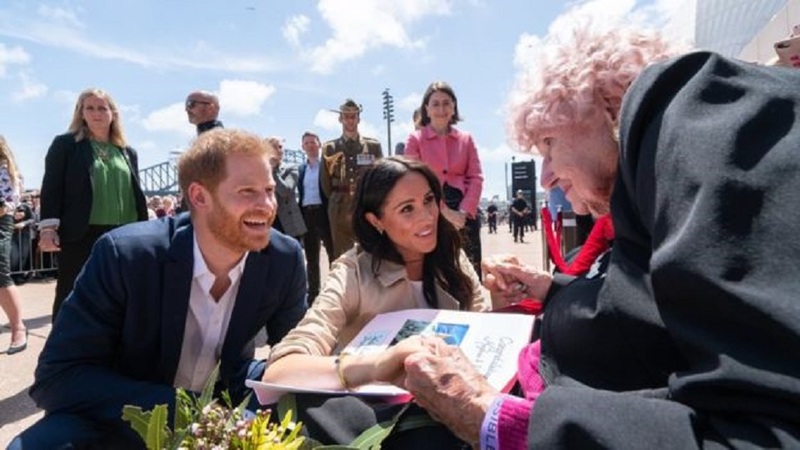 A woman who possibly was Australia’s biggest fan of the British royals has died at the age of 99, just days after receiving a birthday card from Prince Harry and his wife Meghan. Daphne Dunne passed away peacefully on Monday, her family said. She featured heavily in Harry’s Australia trips and has pictures on Instagram of several encounters with the prince in recent years. The widow said she’d had “a very special friendship” with the prince. Just days ago, she received a birthday card from the couple. “Dear Daphne, my wife and I send our warmest wishes to you on the occasion of your 99th birthday on Friday,” the Duke and Duchess of Sussex wrote, according to Australian media, signing the card simply “Harry and Meghan”. Her Instagram account is full of pictures showing her with Prince Harry, with the caption to a 2015 photo saying “the very first time our eyes met, I knew this was the start of something very special”.